"I already had an IQ test this year. Don't think I've ever had one of these." 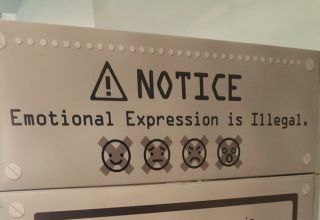 Emotional Fugitive Detector is the funniest game at IndieCade. It’s set in a dark, cyberpunk dystopia where our robot overlords have made emotions punishable by death. Humans are rounded up and analyzed by an uncompromising and ultra-accurate machine that ensures that the population remains as neutral and even-keeled as possible. That’s obviously a bizarre conceit, but it totally works. Emotional Fugitive Detector is a cooperative game for two people sitting on opposite ends of a monolithic gray machine. One person is receiving the test by the stringent robot authority, the other is a hacker who can potentially save their friend’s skin. There are holes cut out of each side of the machine, which allows the partners to make eye contact with each other. The player who’s being scanned is trying to tip the other player off of the specific emotion the machine is looking for—sadness, happiness, surprise, or anger. For example, let’s say the Emotional Fugitive Detector is scanning for happiness. That means I want to show just a little bit of glee, enough for my partner to guess correctly but not enough to get busted by the machine. So in that case, maybe I just curl the ends of my lips and widen my eyes a little bit. Oops, your friend guessed "surprise." Now you’re both dead. The facial recognition software built into Emotional Fugitive Detector is super strong. Going in I thought it’d be pretty easy to fool—I’m sure I’m not the only who’s had mixed results with this kind of tech—but Sam Von Ehren, the 30-year-old designer, has constructed a genuine challenge. "We started working on it about a year ago," he says. "The origin is silly. We went to the Alt.Ctrl exhibit at GDC in 2016 and we were really inspired. We were like, ‘Let’s make a fighting game you control with your face! Let’s torture our players by making them move their faces all over.' But when we were playtesting it, the face-tracking software was really bad, so after struggling with it for a while we decided to throw out the old design and made it more about trying to get around this face-tracking tech. The narrative fell into place after that, and the game was way more interesting than it was before that." Right now, Emotional Fugitive Detector exists as a fun side project for Ehren and his team. The aesthetic specifics of the rig is certainly a barrier to the mass market—most people don’t have a PC equipped with two-way glass lying around—but he tells me they are considering a few options to adapt the game for Steam. "We’re considering different ways to market it," says Ehren. "It’s tough because when people play it, they tend to laugh and look away, and once you look away the tracking is completely off. That was the original impetus of the box itself. But we’re thinking of having a photobooth experience, or in a more serious route, hoping kids with autism could play this to train them how they look at faces. There’s a few thing we’re thinking about, but nothing is concrete yet."